It has been a while since I have had chance to make a full news post here on the blog, but today I thought it would be nice to finally share some of the things we have learned recently. Let's start with Disneyland Resort in California, where a press release revealed some pretty disappointing news for fans of their Halloween Time celebration. According to the press release, this year the Big Thunder Ranch area will not play host to the Halloween festivities, meaning that there will be no special character costumes for Mickey and friends, no villains, no entertainment, no pumpkin carvers, and everything else that goes along with it. This was further confirmed on the Disney Parks Blog in the comment replies by the Disney social media director. Further more, the characters will not appear during the day anywhere else at the park either! In fact, the only place you will be able to find special Halloween greetings will be at Mickey's Halloween Party (the villains will apparently be on Main Street, for example). Mickey's Halloween Party itself is also a let down this year, since the press release and parks blog also confirmed that the Halloween Party Costume Cavalcade will not be returning either! Instead, Paint the Night will run, which is a huge disappointment, because that runs nightly anyway, and can easily be seen on non-party nights. The only other non-news for this season is that there will be a new superhero dance party in Tomorrowland during the parties. There has been no word as to whether Jack and Sally would greet during the day in New Orleans Square, as they have in the past. I guess we shall see soon enough if they survived the cull, too! 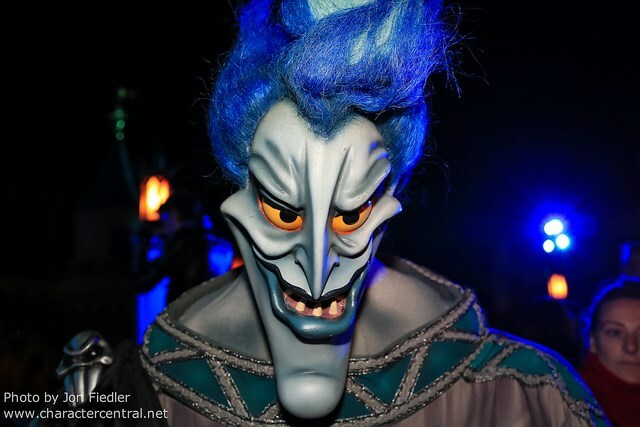 It goes without saying that Halloween Time this year at the Disneyland Resort will be a huge disappointment. Moving across the country to Walt Disney World, and again, the Disney Parks Blog claimed that (again, mostly in the reply comments, and I quote from the communications manager, Shawn Slater) "enhancements" were coming to Mickey's Not So Scary Halloween Party - in the form of no princes greeting with the princesses, no dance party in Frontierland and that the Queen or Maleficent would not be greeting guests this year. Of course, there is going to be a new show on the Castle Stage, which will feature Oogie Boogie and the Sanderson Sisters, who will be making their Disney Parks debut - so that at least is exciting. Rumours have also been floating around the internet, including on this usually reliable Twitter account, of Oogie Boogie being added to the Halloween parade during the parties. Lastly for the US Parks, the Disney Rewards Visa meet 'n' greet at both Disneyland and Walt Disney World will be changing, and will feature Darth Vader! The Star Wars Imperial Meet ‘N’ Greet at the private cardmember location at Walt Disney World will open in early 2016, and at the Disneyland starting fall 2015 (although when exactly is yet to be confirmed). Skipping across the ocean to Tokyo Disney Resort now, today we learned from the Tokyo Disney Resort official blog that the popular Polynesian Terrace dinner show, Mickey and Minnie's Polynesian Paradise would end on 4th January 2016, with a new show, titled Mickey's Rainbow Luau, starting on the 21st March 2016. Interestingly, the venue itself won't close until the 6th January, which means that the other show presented there, Lilo's Luau and Fun, could run for a further two days after Polynesian Paradise ends. The press release makes no mention of the fate of Lilo's Luau and Fun, and we are led to assume that it will return following the three month long closure. What's weird about that is that there will be four shows daily of the new Mickey's Rainbow Luau, at a length of 65 minutes each; with the breaks in between shows, I wonder if Lilo's Luau will be able to continue? When we know more on this, I'll post about it here on the blog. Staying with Tokyo, last week the Parks Blog gave us the name of the new Christmas parade at Tokyo Disneyland. Titled Disney "Christmas Stories", the parade will apparently bring to life the pages of Christmas storybooks. At Tokyo DisneySea, a brand new show, called "A Perfect Christmas", will feature the Disney characters sharing their Christmas dreams. Other returning events this year include "Colors of Christmas", "Snow Crystal Illumination" and "Fiesta de la Luz". Four hours west of Japan, at Hong Kong Disneyland, the Frozen fever continues, with their official Facebook page announcing the other day that their Frozen Village will extend its run through the 4th October. Currently there is a small show in the village area, and you have the opportunity to meet Olaf (I believe after the shows). The final stop on our around the world news tour is of course Disneyland Paris, where I have heard a lot of rumours about Halloween and Christmas (well, mostly just Christmas). We were in Disneyland Paris less than two weeks ago, and found out a lot of info, which has since been going around on various other fan news sites. It should be noted that Disneyland Paris are notorious for their ever changing plans, and nothing is ever guaranteed until the day it debuts! So, what do we have? For Halloween this year the villains will not greet in the Castle Courtyard, but instead at the Royal Castle Stage. They will be introduced as they enter, and then will move to the lower area to greet guests. During Christmas season, Disney Magic on Parade will run alongside the Christmas Cavalcade, after last year's unpopular decision to drop the day parade. Winnie the Pooh will feature in the cavalcade this year aboard a new float - but will be dropped form the day parade during this time. Sadly Max Goof's float has been dropped from the cavalcade, and it is unknown whether he will return to the parade, even if just walking on the ground. The Christmas Tree Lighting is undergoing its latest revamp, with the re-addition of the Disney characters, and this year, Santa also. Santa has currently been evicted from his longterm seasonal residence at the Cottonwood Creek Ranch, due to the Frozen show and marketplace area, which is expected to return for the Christmas season. He does not currently have a new home, but it was rumoured he would appear inside Meet Mickey - but that seems to have already been abandoned. It was also rumoured that Animagique would close earlier than expected, to make way for a new Big Band Beat style show just for Christmas season, before the theatre closes in preparation for a brand new show early next year. However, at this time, it seems as though Animagique is staying put until at least February. Of course, as I said, Disneyland Paris are really bad at giving any official updates, and everything I have mentioned is pure rumour until the day it actually happens - even when they make an official statement things change on the day sometimes! So that's everything for today! It has been a long time since there was any decent character news from the parks, but today I felt it had come to a point where I had enough significant information to share on the blog.